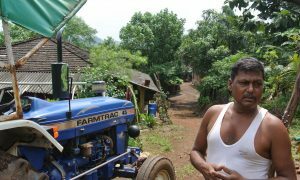 In 19 years, Ramu Gaviti’s six acres of land have gone from barren, dry and sparsely vegetated to fertile, moist and thick with biomass. Peacocks, wild pigs and rabbits have reappeared and in rejuvenated rivers, boys trap fish in baskets. Gaviti once scratched $29 (£23) worth of millet and grass per acre per year. In bad years he left his smallholding in Jawhar, in the hills to the north-east of Mumbai, and went to mine sand at the coast for construction. “Sometimes you feel as if you can go in the river and drown,” said the farmer, who has heard of 50 men who never returned. Now he has more than 1,000 fruit, nut and forest trees, paddy rice, a tractor, a brick house, and an income the equivalent of $1,200 (£975) a year.